It’s time for the annual Niteblade fundraiser! This year’s perks include original art, Niteblade submission feedback, books, subscriptions and story critiques. The Indiegogo fundraiser for Niteblade was a rousing success! This was the second annual fundraiser and it raised $604. I’m sure Rhonda will be able to do lots of fun things with the pledges. Someone bid on the theme issue. So December will have a ghost theme! It should be a challenge to pick the poems and stories for the issue. 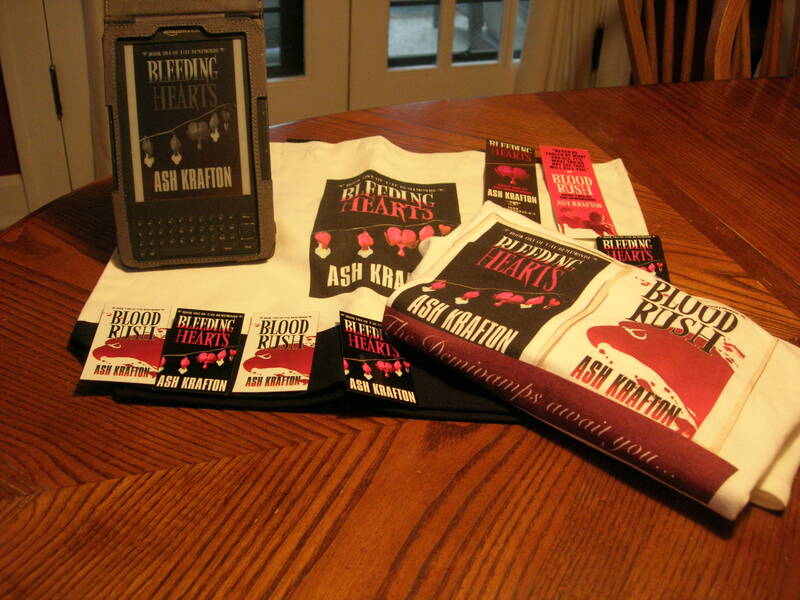 As for me, I donated $20 for a Ashton Krafton’s Bleeding Hearts goodie package. 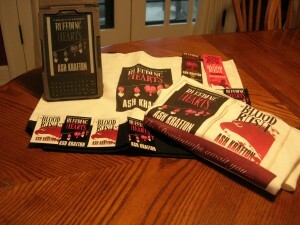 I received an ebook copy (that’s my Kindle with a stand-up case), a tote bag, t-shirt, bookmarks and magnets. All goodies I’ll put to use. In 12 days, Niteblade has almost reached the halfway mark of the indiegogo fundraiser. It’s already more money than was made with last year’s fundraiser. I do the interviews for the site and it’s nice to know people like to see what Rhonda, Alexis and the slush readers are doing. My position isn’t a paid one (nor am I looking to make it a paid position) but does pay the poets and fiction writers who are selected for publication. Niteblade will have their second annual fundraiser next month starting on March 1st. Last year Niteblade raised $108.78. I handle interviews for Niteblade as a volunteer. We’re all volunteers. This year Rhonda Parrish will be using IndieGoGo to run the campaign. Do you have anything you want to donate to the fundraiser? Last year’s donations included books, critiques, knitted items and cookies. Let Rhonda know if you’re interested in donating something. Her email address is rhonda at niteblade.com. I hope you enjoyed yesterday’s stop with Pete Aldin regarding “Because Business is Personal: Why I Like Niteblade”. Today I’m conducting an interview with myself regarding the interviews at Niteblade. I promise it will be a short one. How long have you been doing interviews for Niteblade? I had to look up this answer. When I think of Niteblade interviews I think of the contributor interviews because I do a lot of them. My first interview was in May 2010. In January 2011 the contributor interviews became a regular feature. Do you do any prep work before an interview? Gosh, yes! At times I feel like I do so much that I’ll never get the interview questions done. I look at previous interviews, the person’s web presence, and might even read their work to get a sense of them. It’s not very efficient to read an entire book before formulating the interview questions but I’ve been known to do that once. Or twice. Or um… yeah, you get the picture. The most difficult part is getting started. When I find the theme I use it as a framework for the questions. Everyone interviewed for Niteblade wants to talk about their work or increase their sales. Those questions are easy and get asked dozens of times. It’s no fun for me or the interviewee to see the same questions recycled in every interview. What do you enjoy the most about Niteblade contributor interviews? The questions are pretty much the same for everyone but they don’t feel recycled. I love seeing the answers. The process reminds me of writing prompts. Hand out the same prompts or themes to 20 different writers and poets and you’ll see 20 unique works of art. When I can hear the person’s voice in their responses or feel the enthusiasm jump off the page my heart beats faster. It feels like magic unfolding before my eyes and no one else is there to witness it. Is there any part of the process that’s difficult? Of course. The most difficult part for me is coming up with a blurb or bio to introduce the person to Niteblade‘s readers. It took me most of a week-long workshop to come up with several versions of my own bio. It still gets tweaked. Is there anything else you’d like to share with your Niteblade Blog Train visitors? If you know any fantasy and horror writers or poets who want to be interviewed for Niteblade, let me know. Make sure to mention Niteblade in the email. And happy 5th anniversary to Niteblade! I’ve been a reader since the first issue. I’m squeamish when it comes to horror so it’s really broadened my appreciation for the genre. Tomorrow’s train stop is with Jonathan Pinnock. Today is the final day to help support Niteblade‘s fundraiser this year. It’s the first fundraiser and will hopefully do well. When I last looked there were plenty of items still available in the $20 prize pool – first come, first served. And for $5 you can get your name listed as a Niteblade sponsor. Some of the poems have been nominated for Rhysling Awards. I interview the writers and poets who appear in the ezine with the occasional author with a book to promote thrown into the mix. It’s not a paid position but it’s a fun one. You may have heard of the horror and fantasy ezine, Niteblade, especially if you’ve taken a look at my bibliography page. 🙂 They’re having a fundraiser to help with the costs of running the ezine. The main page for the 2012 Niteblade fundraiser is at http://niteblade.com/home/2012-fundraiser-3/.